We work from your visuals, sketches or description, appoint a dedicated project manager who can advise about our different product, style & specification making the absolute most of your time and money to suit the campaign, purpose or goal. From here a handsample will be provided (this can be tweaked if/as required). Production can be started on approval of handsample, each will be exactly the same as the approved hand-sample, all thoroughly QC checked throughout production then CE tested & carefully packed, ready for dispatch. Depending on what you choose it could take from 4-17 weeks to reach you, so plan ahead! What Custom Toy and Collectable branding options do you have? Your character, mascot, asset or logo can be produced as a Custom-made product in a variety of materials and options. We specialise in fun products which, apart from Bespoke Soft Toys, Keyrings, Figures, Resin Models & Clay Kits include Cookie Cutters, Character Mugs, Dog Leads/Toys, Branded Note books, Pencil Cases etc, ask us or browse our miscellaneous items to get an idea! These can be shaped or feature brands/logo/product of all kinds, often with packaging featuring logo/branding/message. What’s the minimum order quantity for Custom Toys & Collectables? 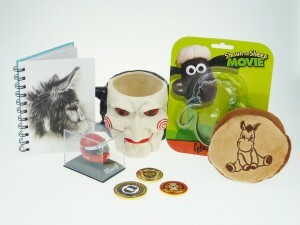 Generally the minimum viable quantity is 500 – 2000 items (however larger, complex or high-value finished Collectables can be fewer). What will a Custom Toy or Collectable cost?